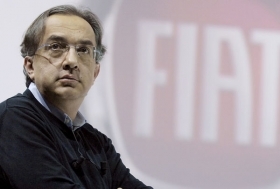 Marchionne wants to create car giant with Fiat, Opel and Chrysler. TURIN -- Fiat S.p.A. submitted two versions of its offer for General Motors units Opel and Vauxhall, one with and one without a bid for GM's Latin American operations, people familiar with the matter told Automotive News Europe today. The offers were submitted Wednesday to Dresdner Kleinworth, an arm of the German bank Commerzbank AG. Fiat, which also wants Saab, said it did not include GM's Swedish brand in its Opel bid because its sale is part of a separate process. Fiat declined to comment on the specifics of its offer for Opel and Vauxhall. Dresdner Kleinworth has sent the offer to the German government and GM. German press reports said that Magna International and Belgium-based holding company RHJ International also have submitted bids for Opel. Fiat CEO Sergio Marchionne told Italian newspaper La Stampa in a story published today that his company's bid has more than a 50 percent chance of succeeding. "Our offer is the only one with industrial content and value," Marchionne is quoted in the paper as saying. La Stampa also quoted the Fiat chief as saying labor union chiefs may prefer the other bids because "they think they could condition executives more experienced in finance than in industry." Marchionne wants to spin off Fiat's core car business into a new company, which would include Chrysler and the Opel, Vauxhall and Saab brands. He envisions eventually folding in GM's Latin American operations. If successful, the combined group would be the world's second-largest automaker by sales. The massive new entity would account for nearly 7 million vehicles sales a year and generate annual revenues of about 80 billion euros (about $109.4 billion at current exchange rates). The expanded Fiat would be listed in Italy and Germany. Chrysler Group LLC would remain a private company controlled by Fiat. GM may file for Chapter 11 protection in the United States if it fails to strike a deal with bondholders before a June 1 deadline. GM Europe's head Carl-Peter Forster said that Opel would not be part of any Chapter 11 process and that its liquidity would last into the third quarter. The German government wants to shield Opel from creditors until a sale to an investor is finalized. It wants to place Opel's assets with a trustee and provide bridge financing for the group until a deal is completed. State bank KfW and the four German states with Opel plants will supply about 1.5 billion euros (about $ 2.1 billion) in financing. GM and the U.S. government would have to accept this model. Sustainable offers for the German carmaker are a German government precondition for the trusteeship model for Opel. However, the U.S. government and GM will have the last word on which company wins the bidding. GM also has asked various European governments for loan guarantees totaling 3.3 billion euros (about $4.5 billion). The Opel sale is expected to be finalized later this year, and the loan will tide it over until October, sources close to the German government said.